Synopsis: A fictitious love story inspired by the lives of Danish artists Lili Elbe and Gerda Wegener. Lili and Gerda’s marriage and work evolve as they navigate Lili’s groundbreaking journey as a transgender pioneer. Review: I gotta say, I feel like the best way to enjoy The Danish Girl is to read nothing about it before and nothing about it after. Reading nothing beforehand will help keep the story at the heart of the movie a secret for that much longer, allowing the rich performances to reveal themselves slowly. Looking deeper into the real life events that led to the construction of the piece is bound to be disappointing as you learn how many liberties were taken with characters that have gained your trust over the previous two hours. 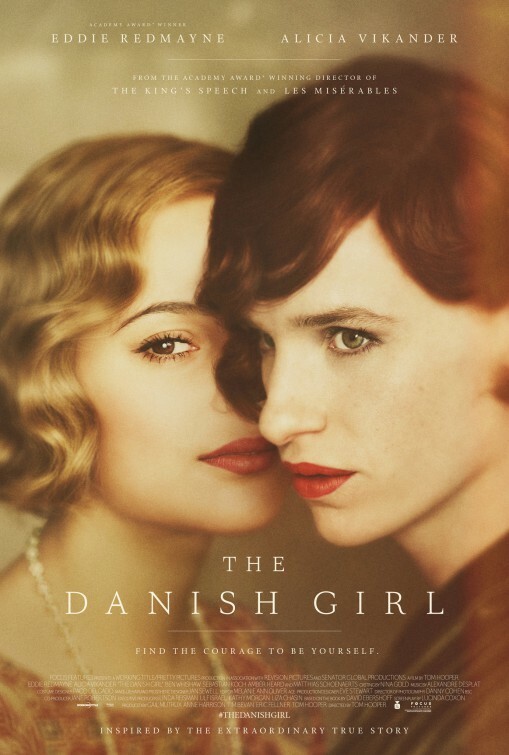 It was only after I’d seen The Danish Girl that I discovered the movie, adapted by Lucinda Coxon from David Ebershoff’s novel was a mostly fictitious retelling of the lives of Einar Wegener (Eddie Redmayne, Fantastic Beasts and Where to Find Them) and his wife Gerda (Alicia Vikander, The Man From U.N.C.L.E.). Artists in 1920’s Denmark, the movie presents the two as a lovely young couple that support their individual work and have an open honesty that allows them to speak truths both private and painful. A more successful artist than his wife, Einar keeps painting the same landscape over and over again while Gerda struggles with finding her own voice through her canvas. What begins as a silly bit of harmless dress-up uncovers a secret desire Einar has harbored that will change the path not only of his life and his marriage, but the path of many men and women in the decades that followed. Einar spends time transitioning between himself and his female alter-ego, Lili Elbe, first behind closed doors and then in public until the line between the male side and female side is blurred and the choice to live one life becomes a necessity for survival. An Oscar winner for his stellar work in 2014’s The Theory of Everything, Redmayne takes a similar immersive approach in his portrayal of Einar/Lili. There’s no holding back when taking on a role with a certain set of requirements and Redmayne meets all of these challenges with believable grace and dignity. Redmayne presents Einar/Lili not as a stereotype or freak of nature but of a human being struggling with a duality of identity that there is no precedent for. It’s become cliché to call a performance brave but that’s simply what it is. He’s matched step-by-step with Vikander’s layered performance as a wife supportive at the outset but who begins to have doubts as her marriage takes on a new direction and the question of what it means to be female is floated between the couple. Some of her own value as a woman is examined and Vikander takes us through each one of these stages of transformation with a realistic hand. Director Tom Hooper (reunited with his Les Miserables star Redmayne) is a bit too focused on the production design (which, by the way, is gorgeous from the intricate set design to the period perfect costumes) and less concerned with the narrative motion of the piece. It’s teeters into a languid stage near its middle section when it should be ramping up its pace. Then we get to the overall validity of the story being told and, I’m sorry to say, as important as the piece is it’s just not honest and the way the movie presents itself as truth is disappointing considering it’s a story about authenticity. Taken as fact, the movie greatly misses the mark. Taken as a work of fiction, The Danish Girl is a strongly acted work of revisionist history. Here’s hoping that one day down the line a more fact-based retelling is attempted.